Is my manufacturing template suitable for banner sign printing? Make a file that will pass automatic printing stages with minimum human involvement. A 'successful file' will have answered all the questions below allowing automatic systems to begin. A manufacturing template is the file MATCHED to the order manufacturing size requirements. Downoad it, OVERLAY your creative onto it and re-upload as your order. ie; includes neccesary edge waste, positioning and fold allowances. Are you going to 'Do-It-Yourself' ??? #1 Is it big enough for Large Size printing? Typically, signs and banners are large and require large file sizes. A file that is too small or incorrectly saved is #1 error. Small paper documents, website logos etc are not suitable for large sign printing and will not pass automatic processes. You will need to upload the ORDER SIZE + FOLD OVER BLEED dimensions for automatic processes to begin. If you are unsure how to create a full size 1:1 file with bleed, we recommend you commission a professional freelance graphic designer with experience setting up and composing signage. Correct design specifications must be used for automatic printing. If you are unsure how to create a file suited for automatic wholesale printing, please watch our handy videos or employ a professional graphic designer to assist you. What is the correct size with bleed? Some bleed sizes are: 1'' hem, the hem is called Material Over Size (fold over bleed) that the factory cuts and folds over. What is Flattened for print? A file that is ALL PIXELS is called 'Flattened'. It is a picture image. Flatten all layers, Vector elements, Fonts and Curves then supply a flat 'background' image only, that has your logos-texts-design as one single image. You will need Photoshop or a similar graphics software program to flatten your file. Graphic design programs such as Photoshop allow you adjust the DOTS PER INCH. Each pixel contains a color. For best results USE 72 dpi. Most billboards and banners are printed using 40. We use and recommend 72. We are not like traditional paper printing products, typically signs and banners are manufactured at large sizes. 72 is an excellent resolution for banners and signs. Your print outputs will be printed at 720/1440 duracoestatic digital. You will need Photoshop or a similar graphics software program to adjust DPI. 1:1 means FULL SIZE drawing in your graphic program such as Photoshop. IMPORTANT! Design and Flatten your artwork files AT FULL SIZE. 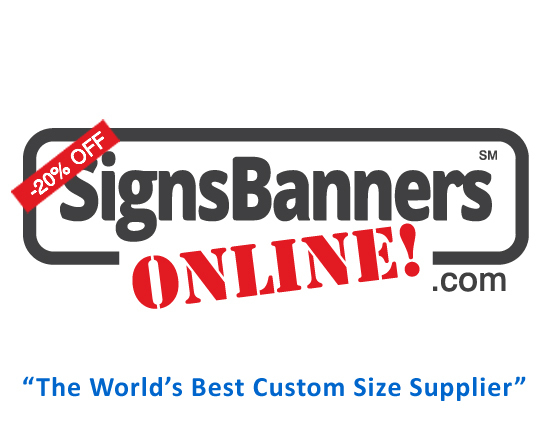 A banner sign file is large dimension - the same as your order Material Over Size dimension with bleed. If you are unable to do this. We recommend you commission a professional graphic designer. How do I get the correct dimensions? Are your raw files big enough for large sign printing? We use and recommend the Easy Template Maker. The Easy Template Maker allows you generate a custom size that includes all the correct elements you need including bleed. Download the template, open in your favorite graphics program such as Photoshop. Then you can insert/overlay your graphics, Flatten and Save as a PDF...and begin your order. At 72 dpi most HUGE banners flatten to less than 148mb. If your banner is over 148mb, please use the 'Let Us Design - Attach & Send' and we will do it for you. Photoshop PDF. You can also submit .ai, .psd, .jpg, .png however depending on their 'inner' meta data they may not pass automatic processing and may be delayed while we inspect the file. If you are unable to create a Flattened Photoshop PDF we recommend you commission a professional graphic designer to help. See Design Guides. You can use CMYK or RGB. RGB will be converted to CMYK digital. Specific color numbers are converted to CMYK digital. Customize your 'original' set-up by choosing the options and features of the Easy Template Maker. Download your template, open and overlay your graphics. The Easy Template Maker ensures your files are suitable for wholesale printing. We use Web2Print technology developed by S B O. When you order, your files are automatically inspected and instantly placed into the printing queue and printing begins. It's easy however there are few things you must do. Use and follow all the instructions The Easy Template Maker gives you. Commission a professional freelance graphic designer or our 'Let Us Design' service and we do it for you.